The book is quite interesting and it grabbed my attention from page one. At first I wasn’t so sure about the story because it felt like your typical teenage angst-driven drama, where the characters are, well, teenagers, and behave as such, meaning that they are over the top, self-centered and dramatic. And don’t get me wrong, they are (or Hadley is, at least), but at some point I stopped being bothered by this and started rooting and understanding her. Hadley was young and felt betrayed by her father. It’s one of those situations where you realize that your parents are flawed and human, it’s difficult to accept it and even more difficult to do so at 17. So she’s angry, scared and she doesn’t know what to do but lash out. I found her character realistic, annoying and endearing, all at the same time. She definitely won me over because I went from thinking: “Oh grow up Hadley, you’re being unreasonable and childish. The pain won’t go away but just learn how to deal with it already!” to thinking: “I hope she makes a scene and ruins the wedding because her dad deserves it”. So apparently this book has the ability to induce regression since I became a spoiled brat while reading it. Halfway through the story I was completely into it. 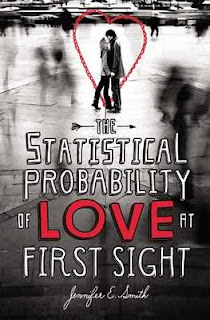 Oliver, the hero, wasn’t as fleshed out as Hadley and plays more of a secondary role since I believe the book is more about Hadley learning to accept the new circumstances in her life, than an actual love story. However, he was an endearing and swoon-worthy hero. There’s a bit of a mystery surrounding him that was pretty obvious to me, but still represents an interesting contrast to what’s going on in Hadley’s life and once again shows us how self-centered and blind we can be when it comes to our own problems. My favorite thing about the whole book was the love story. Despite what the title says, there isn’t a love-at-first-sight moment, there’s an instant connection and the characters share some incredible chemistry, but the end is more like a beginning or a promise of things to come, which I always find fitting when it comes to YA novels because the idea of teenagers finding forever love makes me uncomfortable. At least I want to think that there’s going to be a long, long courtship in the middle. A compelling prose but teenagers don’t think or speak like that, at least not usually, and certainly not Hadley. All of her dialogues are those of a regular, somewhat mature, 17 year old, so that inner-dialogue and descriptions felt unrealistic and out of place. Having said that, I did enjoy the writing style and I can’t wait to read more by this author. Overall it was a quick read and a different YA novel. I’m sure fans of the genre, and of romance in general, will love it. It was a touching tale about forgiveness and coming to terms with not-so-perfect circumstances, a beautiful love story with a wonderful portrayal of a complex father-daughter relationship. I have been curious about this book. Every time I see it in the book store I contemplate buying it. I'm glad to know that the story was at least enjoyable. And I hate when a character's inner dialogue doesn't match them or how they would really talk or think at all. But overall it sounds like a good story. I'll have to grab it one day. Nice review. I really want this one. I MAY have to splurge on it next time I get paid. It just seems to...hopeful. Other than the inner-dialogue which does seem a little too mature for a 17 year old, I'm glad you enjoyed it! The book is very appealing, right? So pretty! And yes, is a good story, I enjoyed it quite a lot and I think it’s a bit different from the usual YA stuff. Let me know if you read it! Same to you, Nath. Let me know how you like it! I’m not sure if hopeful is the right word to describe it, I guess in a way it is because Hadley gets over her issues with her dad, at least enough as to be able to have a peaceful relationship with him, because you never get over something like that, IMO. But it’s not really a happy book, it’s more brooding, but a very good read. If you do splurge and write a review, let me know so we can compare notes! Oh I am glad you clarified the love at first sight thing. It sounds more realistic as a connection with promises to come. I'm really glad you read and reviewed this one. I might give it a shot. Obviously by they get their HEA and I'm sure they'll get married eventually, but not now!! Which is good and more realistic. Hi Dixie, long time no see! It was good, right? I need to go visit your blog to catch up! Thanks for stopping by. So apparently this book has the ability to induce regression since I became a spoiled brat while reading it. Halfway through the story I was completely into it. I plan on reading this one, too-- so glad you enjoyed it. I did enjoy it a lot! Likeable characters and different plot, loved the ending in particular. Let me know how you like it!